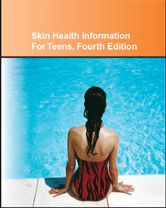 Skin Health Information for Teens provides information on medical conditions that affect the skin, hair, and nails. It describes the basics of healthy skin and skin care, taking different skin types into account. It explains prevention, warning signs, and treatment options for skin cancer and spells out the risks of tanning-outside and indoors.